Shanahan studied Rosen a lot more closely this week after the rookie made his first career start in the NFL. Now he has to face him when the Arizona Cardinals (0-4) visit the 49ers (1-3). Shanahan came away impressed, even though Rosen threw for only 180 yards and one touchdown in a 20-17 loss to Seattle. 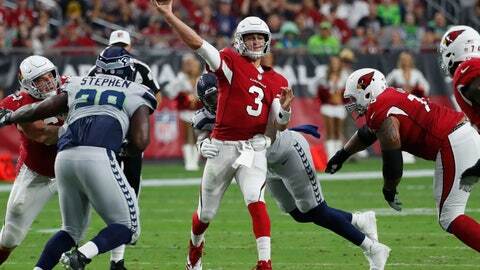 Arizona needs plenty of help as the NFL’s only winless team. The Cardinals have lost their first four games for the first time since 1986 — two years before they moved from St. Louis to the desert. The Cardinals’ 37 points are their fewest after four games since 1945 and the fewest in league since Jacksonville had 31 in 2013. Arizona has gained only 834 yards with Sam Bradford and Rosen at quarterback, tied for the fewest in the NFL after four games since the expansion Texans had 774 in 2002. The lack of early success hasn’t shaken the confidence Rosen gained in college at UCLA when he played well enough to become the 10th overall pick in this year’s draft. Niners QB C.J. Beathard took a beating once again last week in his first start after Garoppolo went down with a season-ending injury. Beathard was sacked once and took nine hits in a loss at the Chargers behind a makeshift offensive line hurt by knee injuries to tackles Joe Staley and Mike McGlinchey. Center Weston Richburg is also nursing a knee injury this week, leaving major questions for the 49ers. Beathard took 19 sacks and 57 hits in five-plus games as a rookie last year. Larry Fitzgerald has more receiving yards against San Francisco (2,169) than he does against any other opponent. Only Jerry Rice has more yards receiving against a single opponent: 2,731 vs. the Falcons and 2,551 against the Rams. With a touchdown catch, Fitzgerald would have 18 TD receptions against the 49ers and 18 against the Rams, more than any active player against a single opponent. A touchdown catch also would be Fitzgerald’s 111th, tying him with Tony Gonzalez for seventh on the NFL career list. Niners second-year TE George Kittle is emerging as a reliable target. He ranks third among all tight ends with 316 yards receiving this season after catching six passes for 125 yards, including an 82-yard TD last week. His 316 yards this year are more than he had in any of his four college seasons at Iowa, where he was teammates with Beathard. Arizona kicker Phil Dawson will become the 11th player in NFL history to appear in 300 games. But that wasn’t what was on his mind all week as he pondered the missed 45-yard field goal that may have cost the team a victory against Seattle. He tried to diffuse the situation a bit with humor, walking around the locker room. It did produce a few smiles. “But obviously I’m suffering each and every moment,” Dawson said. Shanahan is quite familiar with Arizona’s style of defense, having gone against Cardinals coach Steve Wilks when Wilks was an assistant in Carolina for many years. Shanahan faced the Panthers six times over the past four seasons, including in his first game as 49ers coach a year ago.